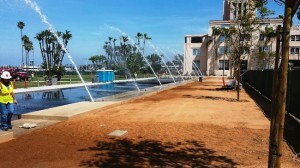 Almost 20 years in the making, a new Waterfront Park adjacent to the San Diego County Administration Center (CAC) located at 1600 Pacific Hwy, will finally be unveiled on May 10 and the public is invited. Being touted as the “new Civic Treasure” by county officials, the $49M park is designed to accommodate a myriad of events, including concerts, festivals, weddings company events and just a simple day near the bay for area families. Originally part of the North Embarcadero Visionary Plan — a joint agency project that involved the County, the City of San Diego, the Navy and the Port District — in May of 2011 the County Board of Supervisors voted to take the project on alone. Just three years later, it is finished. The May 10 unveiling will begin at 10 a.m. with a ribbon cutting ceremony with distinguished guests and a number of speakers. Once the formal aspect of the program is complete, the fountains will turn on and the rest of the celebration will begin. Attendees will enjoy an Arts & Culture Zone, a Farmers’ Market, a Kids Zone, a beer and wine garden, environmental activities, a sports zone, a classic car show, live music, food trucks and arts and crafts wrapping up at 6 p.m.
Normal operating hours once the park is opened to the public will be 6 a.m. to 10 p.m. and the County Sheriff’s Department will provide security 24 hours per day. Trees, fountains and gardens abound at this new park, which takes up 12 acres including the 4-acre CAC that was dedicated in 1938 by Franklin Delano Roosevelt. Roosevelt’s daughter-in-law Mary will be in attendance at the May 10 unveiling. 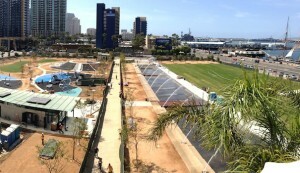 This park is unique in that most all the other parks along the waterfront are owned by the Port District; this property is owned by the County of San Diego. Heinze’s staff, which is responsible for 1,100 buildings in the 4,200 square miles that make up the County of San Diego, was lead on the project. 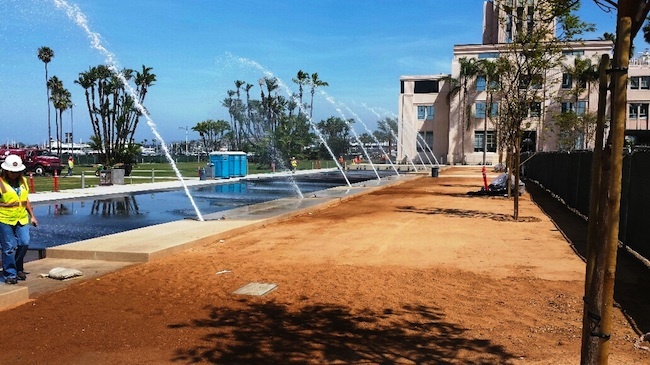 Heinze, who has worked with the County for seven years, said the original plans for this park began nearly 20 years ago, when the Embarcadero’s early visionary plans were first taking shape. Several proposals for the property were tabled, including plans to commercialize the area with additional office buildings and hotels. “That got nixed in favor of a public park space,” she said, adding that the more urban Downtown San Diego became, the more interest there was for development of a civic park, with more pedestrian friendly activities along the waterfront geared toward both residents and tourists. The park’s design was completed in 2003, but then it sat on a shelf for nearly a decade before funding was approved and the project moved forward. The park includes seven fountain basins, 31 water jets, a series of bridges to elevate visitors above the water, a reflecting pool, and an initial 80,000 gallons of recycled water, which will be stored and treated in an underground reservoir to keep it safe for the public. Underneath the park are 250 parking spaces, built with 15,000 cubic yards of concrete. The spaces are a mix of public parking, ADA and clean-air vehicle spaces. Some of the spaces will be saved for senior County officials, while the majority of the spaces will be for the public who are coming to do business at the CAC. 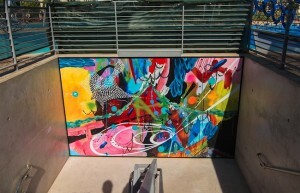 The work of two artists was chosen to greet visitors as they journeyed from the parking lot to the park. 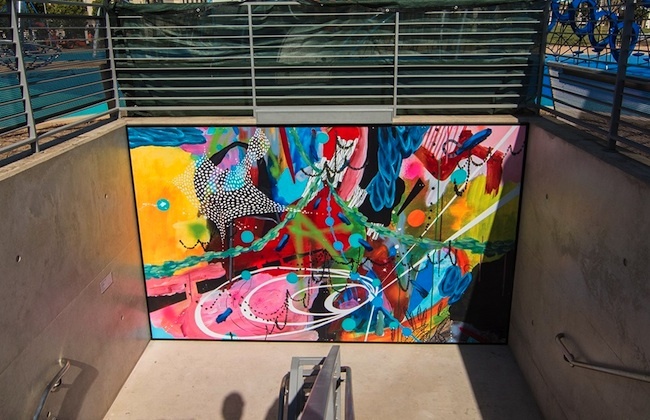 Allison Renshaw of Encinitas, and Harold Cohen, a professor at UC San Diego, were the artists chosen by a committee that consisted of the project’s architects, an art consultant and county staff. Final recommendations and approval was provided by the county supervisors. The original paintings purchased for the project are now on display in the County Administration Center. “We turned an asphalt parking lot into a civic amenity for the region,” she said. “If you have ever driven down there in the past on nights and weekends it was a big empty parking lo t— no body is around, no one is using it, it was just a dead space. Now we’ve turned that into a park, it’s not just for the people who live Downtown, it is a destination. 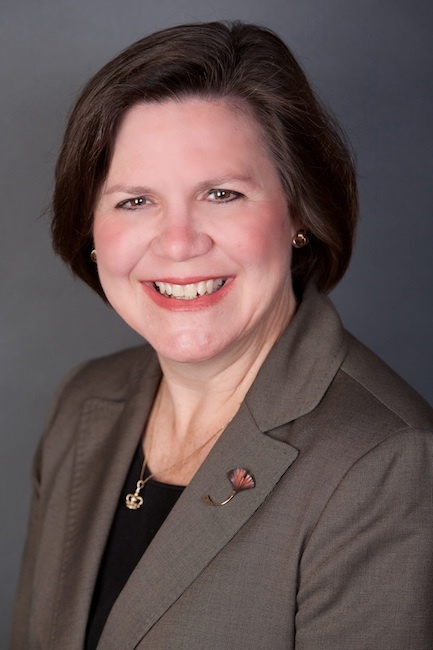 A Naval civil engineer for 23 years who retired as a Captain before accepting her job at the County, Heinze is quite proud of her team, the end result and the benefits to the region. “Charly Marchesano [Chief of Project Management] and Susanne Evans [Project Manager] have been the real core lead on this through the whole construction phase of getting this thing built,” Heinze said. “It is no small feat to not only do a project of this magnitude but do it right in the front yard of your bosses. “So to have all of the county supervisors and other elected officials walking through your project every day and looking out the window and providing constructive comments and still be able to get your job done and make it come out on time is pretty extraordinary. They really ‘turned-to,’ to the challenge,” she said. The grand opening on May 10 is open to the public and Heinze said it will be a full day of celebration. For more information about the grand opening festivities, visit sdcounty.ca.gov/parks/press/CACWaterfrontParkGrandOpening.html.